New York Yankees..... This is the Elusive Vintage VERY RARE 1930s - 1940s Original Louisville Slugger NUMBER 25 Hillerich & Bradsby mini baseball bat. This is the elusive and one of the rarest and the hardest to find 22 INCH Mini baseball bat in good condition retaining all its original color. 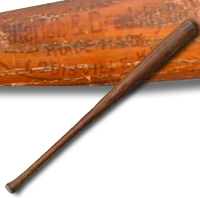 This collectors bat has been very well cared for over the decades.